Williams syndrome is an uncommon genetic illness which occurs one in eight thousand births. This disorder delays the development of multiple body parts. Sometimes Williams syndrome is unable to detect, but majorly we can found associated problems such as heart problem, blood vessels disorder, kidney problem, facial features disorder, concentration problem, stress, phobia and learning problems in children. The abnormality of chromosomes causes Williams syndrome. During conception, around 25 – 28 genes called elastin deletion occur which results in various heart diseases and blood vessels deformities and lead to Williams syndrome. Elastine is an elastic protein which connects tissues and allows the body to get the original shape after stretching. It helps body skin to get back into its original form after pinched. Elastine gene is necessary for load carrying tissue which required for mechanical energy to store. It is also known as the ELN gene. The number of gene deletions may vary among people. According to research, a different individual has different signs of Williams syndrome. Thus, they need medical supervision and therapy methods to overcome. There are 50% chances of the parent to pass the Williams syndrome to children. The people with Williams syndrome face difficulties with intellectual abilities and have an abnormal facial appearance. They also face trouble while engaging in activities, such as puzzle assembling or drawing. They can perform better in activities, such as music, language. Facial features in young children reported, such as the broad forehead, short nose, full cheeks and extended mouth. Whereas, older children and adults have a long face and widely spaced teeth. The people with William syndrome are charming personalities and extremely interested in socializing and over friendliness. The life-threatening symptoms of William syndrome are related to the heart problem which called as supra valvular aortic stenosis (SVAS). If this condition is left untreated may lead to heart failure. People with Williams syndrome struggle with many heart problems, commonly abnormal heartbeats and the shortening of larger blood vessels as well as supravalvular aortic stenosis. Some people have hyperacusia and phonophobia which relates to hearing loss, but this may happen due to a malfunctioning hearing nerve. However, individuals with WS can also love music. Generally, they also look to be a higher prevalence of left-eye and left-handedness. Ophthalmologic problems are common in Williams syndrome. Up to 75% of people in some research have strabismus (crossed eyes), especially esotropia(in which both eyes turn inward) because of internal subnormal binocular visual function and cognitive loss in visuospatial construction. Even, some people face difficulty with visual processing which relates to complex spatial. The absence of important genes affects brain functions including deformities in the cerebellum, right and left part and result in damage to the ability to listen remember and reason and create behavioral timing. Therefore, people with Williams syndrome identify the object but struggle with the construction of visuospatial – the ability to see the object as composing and recreate in small parts. People with Williams syndrome are often friendly and more talkative, showing the reduced repression capability that arises from dorsal-frontal deficiencies. Several studies claim that the amygdala of a person with Williams syndrome has a higher volume than the normal person. 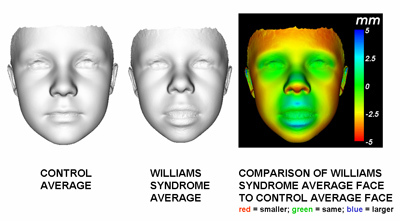 Generally, neuroimaging studies show that people with Williams syndrome have limited amygdala reactivity in response to socially terrifying stimuli (such as disapproving appearances), but confirm hyperreactivity in the amygdala when displayed with nonsocial fear stimuli (such as frightful animals). The initial noticeable developmental symptoms include low birth weight, difficulty during breastfeeding, inappropriate weight gain or weight loss, sleep difficulty causing headache and fatigue, digestive acid reflux. According to research congenital heart problem is detected at an early age, in fact in the appointment with the pediatrician. An infant is more likely to develop abnormal heartbeat which can be a warning sign. In Williams syndrome the language development shown very slow compared to healthy children. Another symptom is noticeable as a delay in motor skills development such as muscle response to specific actions, the ability to feel the response of muscles. Adolescent and adults manage to achieve average weight and height as compare to the non-affected individual. As an individual with Williams syndrome, the child becomes extreme with age and develops joints frequently or abnormally develop the muscles tone. People with Williams syndrome are reported as highly anxious and develops phobia which is linked with hyperacusis – high level of sensitivity to the specific frequencies of sound. As compared to normal, children with Williams syndrome show the remarkably higher number of fears. William syndrome also strongly correlated with attention hyperactivity disorder which results in social disinhibition, poor concentration problem. The cognitive abilities of people with Williams syndrome having mild to moderate levels of intellectual feebleness. According to the study of 306 children with Williams syndrome shows IQ scores ranging from 40 to 112 with a mean of 69.32 which is an average in non affected people. IQ score above this range as shown in the people of less genetic deletion. In many cases most affected, people are unable to orient themselves and experience visual problem in a given task. Many adults are unable to understand solving the simple puzzle of 6 pieces which is designed for young children. This visual perception is related to damage to the dorsal cortical pathway for visual processing. According to Dykens and Rosner research in 1999, the people with Williams syndrome are kind, such as 87% of people are empathize with other’s pain, 84% are caring, 83% unselfish. An infant with Williams syndrome makes eye contact with others. Young children approach and hug a stranger. The individuals are highly empathetic and less aggression towards other. According to research the presence or absence of the NCF1 gene on chromosomes 7 is linked to the risk of developing hypertension in people with Williams syndrome. Therefore, lack of this gene becomes an emerging factor. In most cases, Williams syndrome is not genetic, but it occurs because of the malformation of reproductive cells (sperm or egg) in a parent of an affected person. Gene’s disorder may occur in people without any family history related to William syndrome. The diagnosis of Williams syndrome conducted with the help of symptoms such as physical characteristics, blood test, and the genetic test. Physiological symptoms, such as cardiovascular problem and infant have feeding disorders. The doctor can suspect Williams syndrome by confirming two probable tests such as microarray analysis and the fluorescent in situ hybridization test. The test analyzes the chromosomes #7 and the presence of the elastin gene. Nearly, 98-99% of people with William syndrome deficit 7q11.23 sections of chromosome #7, where the elastin genes are found, are a noticeable sign of the syndrome. The epidemiological studies show that the effective method to diagnose William syndrome depends on the cardiovascular problems and facial features. According to some diagnostic research describes that depending on only the facial feature to identify Williams syndrome could be a wrong diagnosis of the disease. It is recommended that to find more reliable features such as congenital heart problem, puffy eyes, and an appearance of long and smooth philtrum (middle area of the upper lip). Less positive signs, such as a wide mouth, tipped nose, and long neck. Research shows that it is difficult to find the William syndrome only with facial features. William syndrome is an incurable disease. The best way to prevent is to avoid the vitamin D and extra calcium and manage blood calcium high levels. Narrow down of blood vessel could be a vital health issue which needs to be treated by a specialist. Patient suffering from low muscle tone and joint stiffness can practice physical therapy. Speech therapy can be helpful for children to increase their social interactions. Other treatments depend on the specific symptoms of the patient. Children with Williams syndrome and related heart problems need a comprehensive analysis at the clinic, which is familiar to rare congenital heart ailments. The specific heart test is performed to know the severity and exact defects. Some children with severe heart condition need a surgical procedure to restore the affected areas. Behavioral treatment has determined effective by learning basic skills for socializing. Let them know the appropriate ways to approach people and how to socialize in the workplace or school can help. Suggest treatment is therapy to manage fear or phobia shown in cognitive behavioral methods. Make sure the charming face of the patient not hiding any feelings. Music is one of the most effective treatments for people with Williams syndrome. Individuals with Williams syndrome are enthusiastic towards music and has a special fondness for rhythm and pitch task. According to research, music helps to reduce the inner and outer anxiety, which is bothering to people with Williams syndrome. People with Williams syndrome not only affectionate with music but also they have strength toward hearing sensitivity, ability to remember lyrics and sense of rhythm which all help to manage weakness. Music therapy is used in educational sessions to help them understand math skill and subject concepts. Before introducing Williams syndrome and scientifically understanding facial features, people believed that the people with the syndrome who have charming personalities have magical power. These beliefs proposed the origin of fairies and folklore of elves and other forms of good people. Williams syndrome occurs 1 in every 20, 000 live birth but according to recent epidemiological studies shows that the disease occurrence rate increased to 1 in every 7,500 live births. As the evidence found in large amount suggests that Williams syndrome is more common than previous reports. Approximately 6% of all cases found as developmental weakness. The consideration of William syndrome reported after getting a large group of peoples with lack of facial features and decreased IQ. 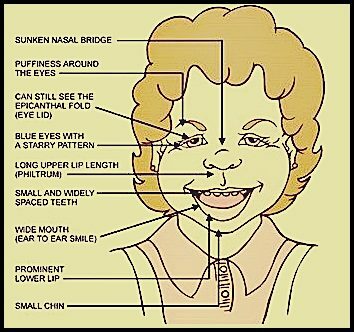 Noonan syndrome: A rare genetic disorder found at the time of birth and having symptoms of facial features disorder. Idiopathic infantile hypercalcemia is described by the rise of blood calcium levels in a newborn without any visible cause. Leprechaunism is a rare growing endocrine disorder identified by an overgrowth of the pancreas, Insulin resistance, and high levels of estrogen. Symptom includes short legs and arms, long hands, short ears, pointed chin. May organization provide support to people with Williams syndrome, including William syndrome Registry and Canadian Association for William syndrome. They provide resources to help and get a proper diagnosis and treatment. Some individuals with Williams syndrome have a normal lifespan, but for some people, medical challenges show that the life is shorter than normal. Almost 1 in 4 individuals diagnosed with some intellectual disability and some need full-time care. Rest other people can live a regular life. The authors concluded that continued research could help to find the better ways to ease the life of people with William syndrome.